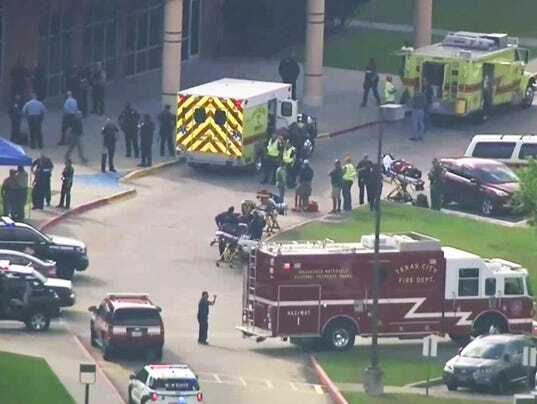 Ten people are dead after a shooting at a Texas high school Friday, authorities said. Explosives were found on the school campus and off the grounds, officials said. The official, who is not authorized to comment publicly, said multiple pipe-bomb-type explosives were recovered at the school, though the official said investigators were still going through the school. The suspect was identified as Dimitrios Pagourtzis, 17, according to another official briefed on the investigation but not authorized to comment publicly. It’s not USA TODAY’s policy to identify minors charged with crimes. Due to the magnitude of the event and the fact the suspect could be charged as an adult, USA TODAY has decided to identify the suspect. The suspect was armed with at least one rifle or shotgun, but the first official cautioned that there could be other weapons related to the incident, though not yet recovered.